Creating a Wish List for books and other items is simple at Roundabout Books. First, start by clicking on the My Account tab in the main menu and creating an account. Then search for a book that you want to add to your list. Once you've found it, you'll see an "Add to Wish List" button under the book photo. 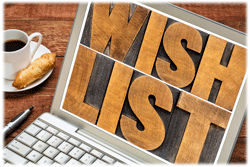 As long as an item is listed on the web site, you can add it to this electronic Wish List. You can have a staff member print it out for you and you can tell people you have a wish list at our store when they are looking for that special gift!